Methods of Mortise and Tenon Joinery introduces the student to one of the most basic and universal of woodworking joints. In this course you will learn multiple methods of making mortise and tenon joints. These methods will include use of router and router table, mortising machine, tenoning jig and “Domino”. You will also learn to dimension wood with the jointer, planer, rip saw, and crosscut saw. At the end of nine weeks you will have built a functional and attractive end table, but more importantly, you will have gained the experience and confidence to work with hand and power tools safely and effectively. Students need to bring the hardwood lumber of their choice to the first class. Cut list available below. Thursdays, 12:00 – 2:30 pm, or 6:30 – 9:00 pm, May 23 – July 25. This 9-week session will span 10 weeks. No classes on July 3 and 4. The second of a three course series, Methods of Mortise and Tenon Joinery, introduces students to furniture making and various hand/machine woodworking skills. 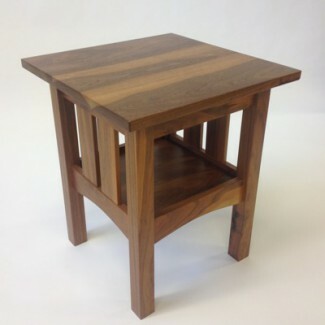 The construction of an Arts and Craft style end table is the method used to impart these skills.